News flash: 96 days until Christmas morning. Does that thought make you panic? Do you know how you’ll pay for all of the expenses that the holiday season brings? Gifts, decorations, holiday cards and let’s not forget the food. Rather than succumb to the chaos, let’s plan together to spend only what we have and not put one dime of our holiday spending on a credit card. In January 2015, we will not have a feeling of dread when the credit card bills start rolling in. Instead, we’ll start the new year off right because we celebrated a debt free Christmas. 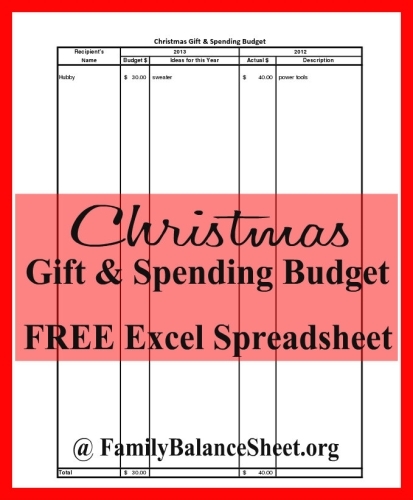 Download my FREE Christmas Gift Spending & Budget excel spreadsheet and get started on your Christmas spending budget TODAY. When your budget is complete, you’ll know how much you need for your holiday spending. If you remember your 2013 holiday purchases, enter them in the two far right columns. If not, don’t worry and just leave that blank for this year and start budgeting your gifts for 2014. Once you complete #1, you’ll know how much money you’ll need. If you have been setting aside cash since last Christmas–kudos to you! But if you are coming up short on cash for your upcoming Christmas spending, there’s still have plenty of time to find the funds. Last October, I ran a very successful series called 31 Days to Find $1000. In total, I found $1155 from my ideas. 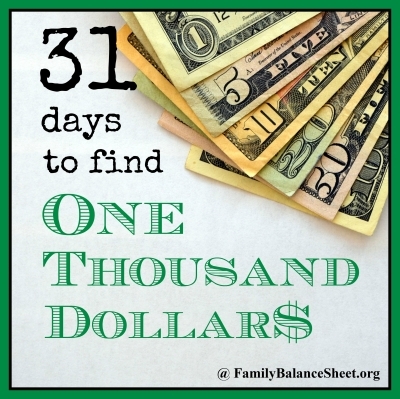 Today, you have 96 days to find the money you need, so head over 31 Days to Find $1000 to start your journey. Have you started planning for Christmas? If so, when did you start planning? If not, do you feel behind or stressed about the upcoming holiday expenses? Let us know in the comments. Thanks so much for this post. I recently wrote a post called Christmas in July where I talk about how we do Christmas gifts in our family. We participate in the Advent Conspiracy where we donate to the recipient’s favorite charity. Whatever your family does, though, planning keeps the focus where it needs to be rather than on the financial stresses caused by not planning. Thanks, again, for the post. I can’t believe it is time to talk about Christmas already! Heather, you’re welcome! I need to go read your Christmas in July post. I love to see how other family’s celebrate Christmas. Hey Krista! Our family keeps the gift list pretty tight. We focus on the kids and get together as a large family for dinner but any gift exchanges between adults happens before we gather. It just makes things feel less pressured.